He also links to the original Seattle Times story that accompanied the photo. And something I didn't notice until I ran outside to get water just now. See, on everyone's office doorstep are copies of the morning paper. From all over. The photo is on the cover of every paper I've seen this morning - The SF Chron, the San Jose Mercury News, The Sac Bee (though it was much smaller there) . . . And the LA Times runs a different photo of coffins being off-loaded at Dover - a photo obtained through the FOIA that Josh refers to in his post. Since all the papers have run articles on the controversy this morning - I better read them and then post again . . . The Los Angeles Times website doesn't have the photo - just has a small link to the story. The lede: A website dedicated to publishing censored pictures and documents released dozens of photographs of coffins containing American war dead, which caused the Pentagon on Thursday to renew its ban on releasing such images to the media. Now, I'm anti-war, very much so, let me say that upfront - but you know that already. I'm also, however, the daughter of a Vietnam Veteran and fiercely protective of soldiers. Yes, you can be both. Hiding the fallen from sight is undignified. 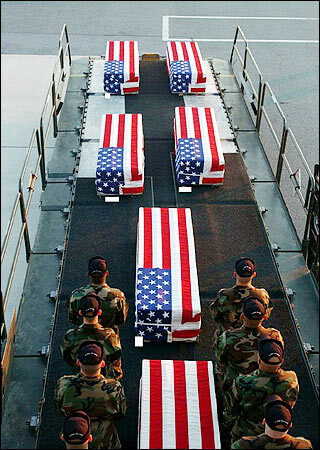 Sorry boys, it is not for the country to honor you now, in full color, because to do so would jeopardize our ability to send more in your wake. It's sort of ingeneous if you think about it. If you don't administer the test, there's nothing to pass or fail. The Sacramento Bee site doesn't even seem to have the story on the front page. On closer inspection of the Bee print edition, however, it's an NY Times story that they're running - so you find it at the Times site. The same story runs on the Chronicle's front page as well. The lede: The Pentagon's ban on making images of dead soldiers' homecomings at military bases public was briefly relaxed yesterday, as hundreds of photographs of flag-draped coffins at Dover Air Force Base were released on the Internet by a Web site dedicated to combating government secrecy. I especially like that's it's not a photo ban, but a "ban on making images." There's something almost mystical in that description. This article, more than the LAT piece, focuses on the military's having taken the photos themselves. There's something to be wondered at there - they recognize the historical value of what's happening, but they are equally mindful of the need to control how that history will be written. There are no first drafts in the Bush Administration, it would seem. 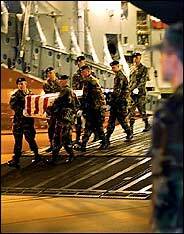 The Pentagon has cited a policy, used during the first Persian Gulf war, as its reason for preventing news organizations from showing images of coffins arriving in the United States. That policy was not consistently followed, however, and President Bill Clinton took part in numerous ceremonies honoring dead servicemen. 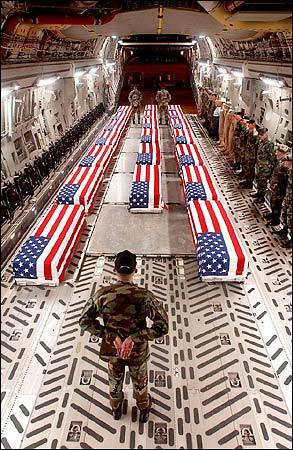 In March 2003, the Pentagon issued a directive it said was established in November 2000, saying, "There will no be arrival ceremonies of, or media coverage of, deceased military personnel returning to or departing from" air bases. Almost enough to make me watch FOX News Watch this weekend just to see them NOT cover one of the biggest media-covering-themselves-covering-the-news stories of the year.